So let's say I told you before the season that there would be a BCS-buster this year from a non-qualifying conference. Doesn't sound too crazy, right? Now let's say that the team is not Boise State. Let's also say that this team is not undefeated, with the one loss coming at the hands of an awful Kentucky club by 33 points. And the club in question has only made a bowl twice in their history and not in 40 years. That club is the Golden Flashes of Kent State, and they may be coming to a BCS bowl near you. To start, let's recap how a team from a non-automatic qualifier receives an at-large bid to the BCS. You are guaranteed a bid if you win your conference and you finish in the top twelve of the final BCS standings. You are also guaranteed a bid if you finish in the top sixteen of the BCS standings and you finish ahead of a BCS conference champion. As of right now, Kent State is sitting at 17th in the BCS standings and with both Louisville and Rutgers losing last week and either of them not being ranked, that could mean that the Golden Flashes could be getting in, and even more so if unranked Wisconsin upsets Nebraska in the Big Ten Championship and if Georgia Tech upsets Florida State in the ACC Championship. 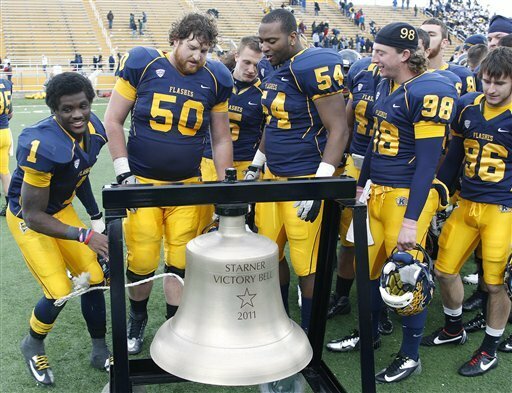 Now Kent State has itself some work to do if they want to shock the nation and get to the BCS. First, they have to defeat a very good Northern Illinois team that is also ranked on Friday night in the MAC Championship (and I picked the Huskies). Then, they need Stanford to defeat UCLA in the Pac-12 title game because UCLA is right above them in the BCS standings and the gap is somewhat big between the two. If Kent State blows out Northern Illinois and if Stanford decisevely beats the Bruins, Kent could be in business with a likely bid to the Orange Bowl. Don't get me wrong, Kent State is a good football club and having by far the best season in their history under second-year coach Darren Hazell. They have a pair of 1,000 rushers, and if you have not seen Dri Archer, who is averaging almost 10 yards-per-carry on 138 carries with 14 touchdowns, you are missing out on a hell of a football player. Plus, they have a good win in defeating Rutgers by 12 in Piscataway and that is a club that could very well end up in the BCS by virtue of winning the Big East. But the Golden Flashes are not a BCS-caliber team. Did I mention they lost to Kentucky by 33! No team that loses to Kentucky by 33 should be in the BCS. But if they make the BCS to get trounced by Florida State (or probably beat Georgia Tech) in the Orange Bowl and take the huge paycheck which would be the world to an athletic program like that. Personally, I don't think it will happen but we have seen crazy stuff from those pesky computers over the years.